It's out again, and affordable. But shame on Sony/Columbia for ignoring this essential recording for twenty years, resulting in prohibitive collectors' prices. This was Brubeck-Desmond's greatest period, before the comparatively sterile, more formulaic studio albums, including Time Out (Columbia, 1959). And shame on those (including this writer) who ever dismissed this recording as too white, too fay, too square, too distant from the "authentic" jazz tradition. The music is squarely in the traditionsoulful, in the moment, unrepeatable. As far as the 1950s public was concerned, two alto players mattered: Charlie Parker and Paul Desmond; and after Bird's death in 1955, only Desmond and Julian Adderley. Although Desmond occasionally reaches higher on the earlier At Oberlin (Fantasy, 1953), Jazz Goes to College, which is the group's first recording for Columbia records, is above all his datea consistently stirring testimonial to an artistry that remains sui generis. Desmond's solo on "Balcony Rock," the opening track (which on the original album was "Take the 'A' Train"), is perhaps a career high pointa chimerical quest, moving from continual anticipation through serendipitous surprise and momentary satisfaction to the realization of satisfying closure. Only in retrospect does any kind of structural map occurnine choruses of blues so seamlessly stitched as to disguise not merely the end of choruses but the blues form itself. Closer analysis of the solo's construction reveals that it covers nearly three octaves, though the liquid tones are so consistent, the execution so unforced, that one can be forgiven for disregarding technique altogether. Despite his penchant for bombast, Brubeck remains in the background, invisible while Desmond weaves his spell. The pianist's ensuing, equally extended solo is more minimalist than Desmond's, scaled to dynamic and textural proportions that complement the forerunner's achievement. Only when the pianist injects an animated call-response riff with flatted 5ths (provoking the crowd's audible approval) does the piece announce itself as a blues, but Desmond soon reclaims it as his own for the out chorus, which is the first statement of the melody. The concert also offers generous examples of Brubeck's characteristic lightning and thunder. Following Desmond's solo on the Mid-Eastern modalities of "Le Souk" (unmistakably anticipating the altoist's "Take Five"), Brubeck expresses his energies in massive, repeated, polyrhythmic chords, the exotic odyssey initiated by Desmond climaxing in a kind of raging raga. Only a fool would rush in after the altoist's angelic flight on "Don't Worry About Me," but Brubeck sustains interest while maintaining a more earthbound course with thick chordal textures and building dynamics. After Desmond's masterful solo on "The Song Is You," however, the pianist all but takes a pass, judiciously ending the piece in short order. In hindsight, the terms once used to described this music"cool school," "West Coast," "academic"seem silly. During this period the Brubeck Quartet commands the undivided attention as few other groups, or individual soloists, in the music's history. If the rhythm section of Joe Dodge and Norman Bates dutifully and gamely "keeps time"so much the better; this is an instance where a "tight swing machine" would have been an imposition, possibly gumming up the works. The swing is generated internally and, rather than the body responding with visceral approval, the mind rocks and reels. Track Listing: Balcony Rock; Out of Nowhere; Le Souk; Take the "A" Train; The Song Is You; Don't Worry About Me; I Want to Be Happy. 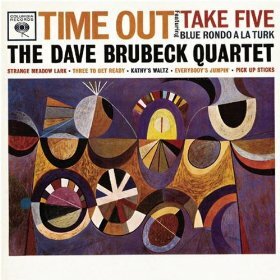 Personnel: Dave Brubeck: piano; Paul Desmond: alto saxophone; Bob Bates: bass; Joe Dodge: drums.